TGIF! I have no idea why, but this week has been brutal. Maybe it was all the exam-making and grading to be done? Regardless, bring on 5 o’clock! Today’s recipe is simple, but absolutely delicious. 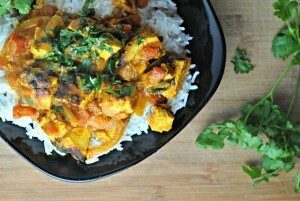 Not only was this recipe assigned to me in another recipe swap (meaning, it’s gotta be good! ), but long ago there were requests from readers for more vegetable side dishes. Veggie sides can be tricky, almost because they’re so simple. If you fail to put any effort into your vegetable recipes and opt for simply microwaving or steaming any old vegetable and calling it a vegetable side, you can’t be shocked when you…and your loved ones (kids! )…aren’t thrilled to chow down. A love for vegetables can only go so far before other choices start to sound a whole lot more enticing. On the other hand, you don’t want to begin frying or slathering your veggies in butter, cream, and other rich, indulgent ingredients. The beauty of vegetables is that they’re not only healthy and low-calorie, but they’re a blank slate. Therefore, the idea is to keep veggie sides healthy and low calorie while adding in flavors that will make you reach seconds! A simple lemon juice and olive oil mixture in this recipe was just enough to take an ordinary vegetable side to a whole other level. Snap off and discard woody bases from fresh asparagus. Cut into 2 inch pieces and set aside. Clean and quarter potatoes. In a large pot, bring 2-3 quarts of water to a rolling boil. Add potatoes and boil for about 10 minutes. Add the asparagus and boil for an additional 4-6 minutes. Drain, and transfer to a serving bowl. For the dressing, combine the rest of the ingredients and drizzle over the vegetables, toss to coat. Serve warm. Yield: 7 servings (about 1 cup each). 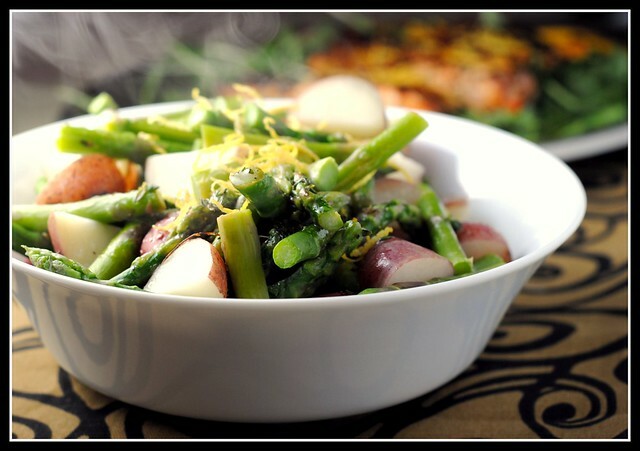 Result: I love the combination of the potatoes and asparagus which both paired well not only together, but together with the lemon-oil dressing. 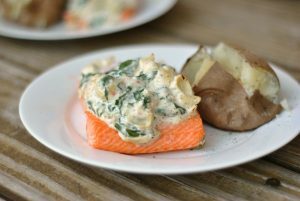 This recipe takes about 16-18 minute from start-to-finish and uses basic, everyday ingredients which makes it perfect for busy weeknight meals. It can be a side to anything from a sandwich, to a meat entree, to a slice of pizza…or even go atop a salad for a fun twist. Enjoy! Of course I have the Rebecca Black “Friday” song stuck in my head. At least it is actually Friday! 🙂 Happy weekend! I love your suggestions for switching it up with the veggies! I am never that creative with my side dishes. I enjoy them plain and simple. However, this recipe looks stellar! Thanks for sharing! I love anything lemon with my veggies – lemon juice and a little sprinkle of Parmesan cheese is my favorite veggie topping! 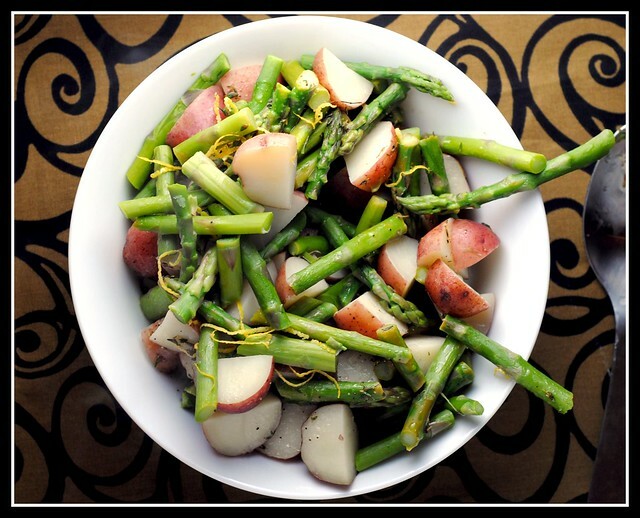 I would never have thought to mix asparagus and potatoes together – sounds like an interesting combo! Vegetable sides usually end up taking more room up on my plate than the main course. It’s weird, but true. And seriously- this week has been rough! We’ve got about 8 hours to go! Yayyyyy! I’m so glad you enjoyed this. It sounds like a great light side dish. I’m obsessed with asparagus… the problem is that I CAN eat it just lightly steamed in the micro with perfect happiness. However, that doesn’t work for my husband… so he won’t share with me when I make them that way! I’ll have to try this one out. Rebecca Black ruined Friday for a lot of us! Now, I’m thinking of it. haha. TGIF I can’t wait for 5pm too! what a perfect prelude to spring side dish! I love new potatoes and have steamed them and roasted them and nuked them with much success..and asparagus? Love that too. Ive paired green beans and new potatoes together in a side dish but never this combo. 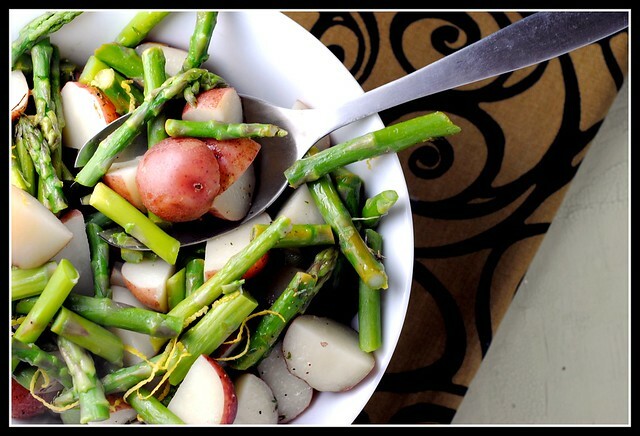 Will def be trying this…esp since I just bought some fresh asparagus yesterday at the store! I bet the lemon and the herbs really bring this dish out! I consider veggie side dishes to be a necessity. (Unless we’re doing salads for dinner). My mother-in-law drives me crazy because she always claims there’s just no time to get creative with sides.